Fernandez & Leluu: Real or Fake? . . . and How to cook a steak! Real or Fake? . . . and How to cook a steak! Hereford is well know for its cattle - 'bos taurus' to the scientifically minded - the Hereford breed originating in Herefordshire in 1742! Recent traditions (this century) would have farmers bring their livestock into the centre of Hereford on a Wednesday (market day) to sell their livestock. I remember the market as a busy, noisy place with a host of animal noises and the constant background rhythm of the auctioneer rattling off unintelligible numbers, seemingly without pause for breath. (which might explain why the auctioneer always had a bright red, verging on purple, face!) There was also, as one might expect, a wide variety of food places, fishmongers, and, of course butchers, I loved it! It transpires that there used to be a china shop on the High St in Hereford which was only a few hundred yards from the old cattle market. I remember going to the market to see the animals as a young child - I'm telling you when you're 3ft tall a fully grown hairy tusked pig is terrifying! With slobber hanging off its tusks these bristly beasties can let loose a blood curdling cry, I'm avoiding saying 'squeal' because that really doesn't do it justice!! Anyway, I digress. It turns out that every now and then a bull would get loose and hot hoof it up Blackfriars St. and along Widemarsh St. to the centre of town!! Some how, I just can't imagine the 1970's Herefordians legging it down the street like a frenzied Pamplonan! More likely to get a raised eyebrow from one of the farmers eating a bag of chips! 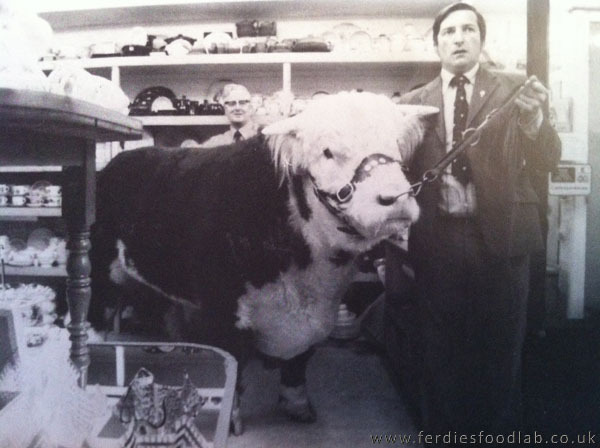 Just to prove a point here's a photograph of one of the escapee bulls posing in said china shop!!! So, the question is: Is the bull real, or a fake?? Leave your comments here - I'd love to know what you think! !